OACAC is a Community Action Agency, established in 1965 to alleviate the causes and conditions of poverty and help people achieve self-sufficiency. The words below make up the promise each Community Action Agency across the nation makes to those we serve. 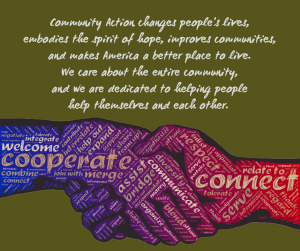 Join us in celebrating May as National Community Action Month, recognizing the work done by more than 1,000 Community Action Agencies, working collaboratively to move the needle on poverty.